Unlikely as it may seem, there is still a part of this universe that doesn't have a Tesco Express or Sainsbury's Local homogenising the immediate area. So what to do? When your nearest local shop is a few hundred light years away, you can be pretty sure that by the time you reach it it'll be closed, or more likely fossilised. 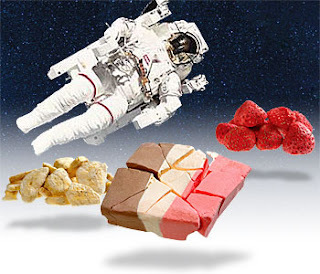 Fortunately help is at hand as NASA, gawd bless 'em, have already considered that the shortage of corner shops in the vast reaches of space may cause a fair amount of inconvenience for hungry astronauts. To avoid the inevitable pitstops at Galactic Malls on un-mapped planets, NASA decided to make sure their astronauts packed a picnic. Several failed attempts at cucumber and marmite sandwiches made them realise they needed to create food that would last a very, very long time out of the fridge. So Astronaut Food was born. Using rather clever and spacey freeze drying techniques, involving vacuum chambers and no small amount of vaporisation, they have come up with food that will last for something like 50 years. Made especially for those that bravely go forth into the great unknown, you too can now tuck into space food, even if your bravely going forth usually just involves a bus. These pukka space delights come in three varieties; Bananas and Strawberries (real ones of course, just spaced up) and, believe it or not, Neapolitan Ice-Cream. So next time you're feeling peckish, but the corner shop just seems like 'one great schlep for mankind', tuck into some top Astronaut Food, it's grub fit for heroes.